Black & white Columbia Basin Irrigation Project images on this page are part of the Rufus Woods Collection housed at the University Archives at Central Washington University. Grand Coulee Dam and Banks Lake feeder canal. The spectacular canyon known as Grand Coulee is considered by many people to be the most remarkable legacy of the Ice Age floods. Was it coincidence, irony or merely engineering logic that caused this wonder of nature to be the location of Grand Coulee Dam � one of the largest concrete structures ever built? The Columbia River Basin of eastern Washington had been a region of scattered small towns, tracts of scablands, and occasional farms whose occupiers struggled to produce decent crops on those patches of land covered by adequate soil. With less than 10 inches of annual precipitation, good crops were harvested only in years of above normal rainfall. There were many dry years, and farmers often gave up. During the 1914-1918 period, civic boosters in Wenatchee, led by Billy Clapp, proposed damming the Columbia for irrigation. The concept gained support from publisher Rufus Woods of the Wenatchee World. Meanwhile, Spokane interests promoted a �gravity plan� to transport water from the Pend Oreille River in Idaho to the Columbia Basin via a 130-mile system of canals, tunnels, aqueducts, and reservoirs. The Wenatchee group then called for a smaller dam combined with hydroelectric generators, which could power pumps to lift water uphill from the canyon to the basin�s higher ground. Throughout the 1920s the two groups battled, but neither gained the upper hand. In 1926 Washington�s U.S. senators secured an appropriation for a study of Columbia Basin irrigation, and in 1931 the Army Corps of Engineers issued a report favoring the pumping plan and a dam at Grand Coulee. At that time extreme drought conditions were bringing dust storms and electric power shortages to the Pacific Northwest. The nation was in the grip of a savage economic depression. In 1933 Franklin D. Roosevelt became President. An advocate of large scale public works projects to stimulate the economy, President Roosevelt was attracted to hydroelectric power. However, the $400 million price tag for the Grand Coulee irrigation project daunted him, and he endorsed a smaller dam for electric power�but one that could be enlarged later. In July 1933 the government approved $63 million for the project, which would be supervised by the Interior Department�s Bureau of Reclamation. "It is now proposed to reëstablish the ancient waterway through the great trench of the Grand Coulee. A mere trickle it will be, compared with the river of glacial times. Reinforced concrete will replace glacial ice; and a part, at least, of the west-flowing Columbia will again be detoured southward." 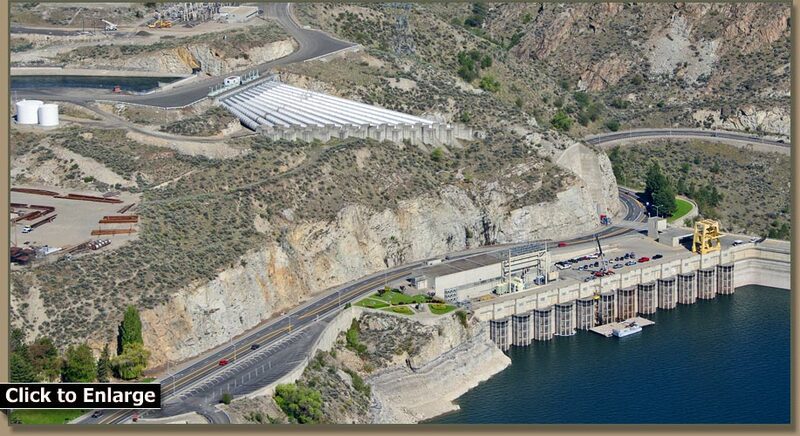 Construction began early in 1934, but within a year�s time the Bureau of Reclamation decided that erecting a future high dam upon the foundation of the low dam posed too many risks of structural defects. The government decided to build the high dam. It proved to be an immense undertaking that would not be completed until 1942. During the course of the project enough material to fill 60,000 railroad freight cars was delivered, more than 11 million cubic yards of concrete were poured, and 12,000 employees were involved. The dam�s portable gates each weighed 150,000 pounds and the inlet pipes had to be fabricated on-site because they were too large to be transported. A system of conveyor belts and a suspension bridge delivered 700 tons of material per hour to concrete mixing sites. The 108-megawatt turbine generators at that time were the largest ever manufactured. The main dam was completed in January 1942: 4,173 feet in length, 550 feet in height from bedrock, and 500 feet thick at the base. The outlet works consisted of twenty 8.5-foot-diameter conduits whose total capacity was 265,000 cubic feet per second. As of June 1943 project costs totaled $162 million. Electricity from Grand Coulee then moved via transmission lines of the Bonneville Power Administration and served the wartime needs of Pacific Northwest shipyards, metal processing facilities, urban areas and the Hanford Nuclear Project. Eventually, the dam was enlarged to accommodate additional power turbines, and the final completed length of Grand Coulee Dam totaled 5,673 feet. The addition of new power generating equipment has brought the dam�s total electric generating capacity to 6,809 megawatts. During the Ice Ages, parts of the region upstream from the Grand Coulee site had been inundated by Glacial Lake Columbia. After completion of the dam, the waters it impounded were named Lake Roosevelt. This vast reservoir stretches 151 miles to the U.S.-Canadian border, covers 125 square miles of surface area, and holds 9.4 million acre-feet of water. The Pump-Generating Plant at Grand Coulee Dam, pumps water uphill 280 feet from the reservoir behind Grand Coulee Dam to a canal that feeds Banks Lake. Two dams were built 27 miles apart in the Grand Coulee to hold irrigation water (Banks Lake). The system allows water to flow either direction in the feeder canal as the reversible pumps at the pumping station are also designed to generate power when demand is high. Although irrigating more that one million acres of the Columbia Basin�s arid lands had been the primary goal of the promoters of Grand Coulee Dam since the 1920s, those benefits were slow in coming. 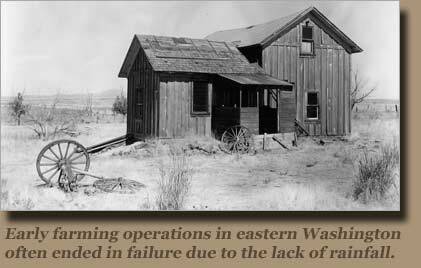 The first deliveries of irrigation water came from an entirely different source�a pumping plant and canals near Pasco, Wash., which entered service in 1948 and watered about 4,500 acres of cropland. To provide water from Lake Roosevelt for this purpose required a pumping plant, 1.6 mile feeder canal, and an equalizing reservoir at Grand Coulee. 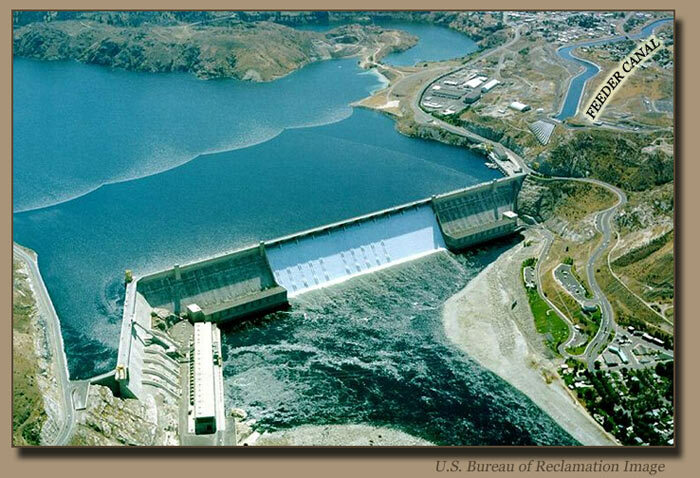 The equalizing reservoir would occupy a 27-mile stretch of Grand Coulee between the dam and Coulee City to the south. Filling the reservoir required two structures�Dry Falls Dam [at Coulee City] and North Dam [near Grand Coulee Dam]. The result was Banks Lake�named for Frank A. Banks, chief construction engineer for the Grand Coulee Dam Project. These facilities were completed in 1951. An extensive system of canals and subsidiary �lateral� canals was designed to feed irrigation water throughout the region. 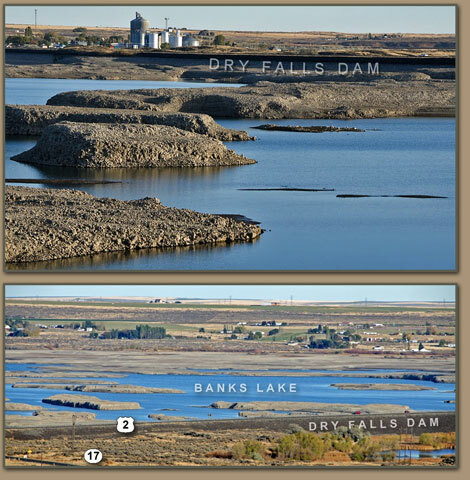 The Main Canal runs south from Dry Falls Dam for 21 miles and includes Billy Clapp Lake�a reservoir created behind Pinto Dam. South of Pinto Dam the canal splits in two. The 88-mile West Canal runs through the Quincy Basin and south to the Frenchman hills. The 87-mile East Low Canal courses southward to Warden and then to near Scootenay Reservoir, where it divides into two branches�one of them ending near Eltopia and the other terminating at the Columbia River south of the White Bluffs, near Pasco. Most sections of these projects were completed by the mid-1950s. In all, more than 330 miles of major canals were supplemented by nearly 2,000 miles of lateral canals. 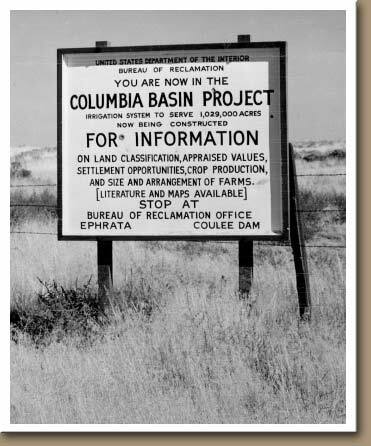 "A unique feature of the Columbia Basin irrigation project is that valley bottom lands will play almost no part except as drainage lines for escaping water.... The glacial river channels, however, will afford excellent drainage and locally can be used for secondary reservoirs and channels." Twin City Foods harvester on Clifford farm in 2008. The property is now farmed by the Clifford's son Glen. This June pea harvest was followed by a planting of sweet corn that was harvested in mid-September of the same year. Government-owned farm units on the Columbia Basin Project were offered for sale to qualified applicants. To be eligible, applicants had to have farming experience, be physically and mentally fit, have good character references, and a net worth of at least $3,700. Veterans received preference over non-veterans. In an �ideal� irrigation system there is no runoff. The ideal is seldom achieved, especially in a project of this magnitude. Some irrigated lands were badly over-watered. O�Sullivan Dam was completed n 1949 to impound Potholes Reservoir, which was intended to serve as an equalizing reservoir that also would capture return runoff from a network of so-called wasteways and drains. Ultimately, the Columbia Basin Project included about 3,500 miles of these channels to remove excess water. Since some of the land earmarked for irrigation was at higher elevations than nearby canals, a network of 241 pumping plants had been installed by the early 1980s. The Columbia Basin development program has brought 671,000 acres under cultivation�well short of the more than one million acres originally planned. Roosevelt administration officials had envisioned a reclaimed region filled with small family farms of no more than 80 acres each�a questionable notion even at that time. 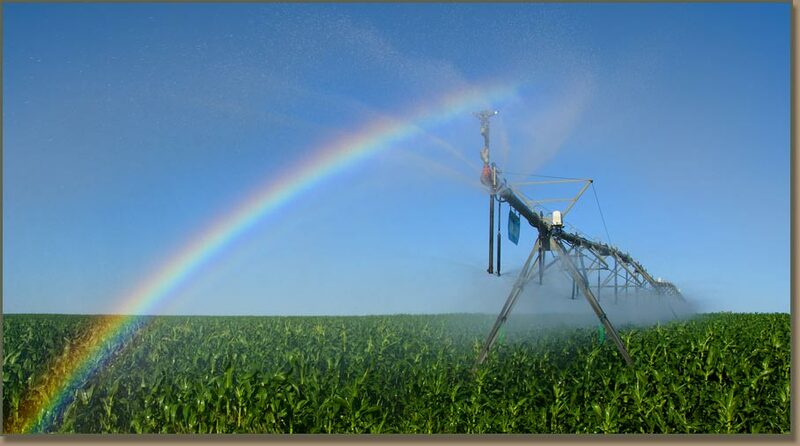 By the mid-1950s when irrigation water was widely available, three times that acreage was necessary to operate a family farm on an economically sustainable basis. The electrical power output from Grand Coulee Dam is impressive and significant. Productive fields of potatoes, sweet corn, peas, carrots, beans, alfalfa, mint and other crops are evidence of an impressive transformation of the basin from wasteland to the agricultural breadbasket of the inland Northwest. "Wheat farming will give place, below the high-line ditch, to alfalfa growing and fruit raising. In the unclaimed or abandoned dry gravel soils sagebrush and bunch grass will vanish, and orchards will spread summer greenery over the gray landscape. This result, if it comes to pass, will be because of the Grand Coulee, product of the greatest torrent of which the earth bears record." Two images at left show scabland north of Dry Falls Dam. USBOR lowered level of Banks Lake in the fall of 2011 for dam maintenance exposing basalt normally inudated by Banks Lake. Franklin County sweet corn is loaded for a short trip to the Twin City Foods processing plant in Pasco. *Black and White images on this page are from the Rufus Woods Collection - Housed at Central Washington University.